Andreas Gartmyr has taken to Kickstarter to raise the funds to create an exclusive range of handmade electric skateboards with each one being unique. 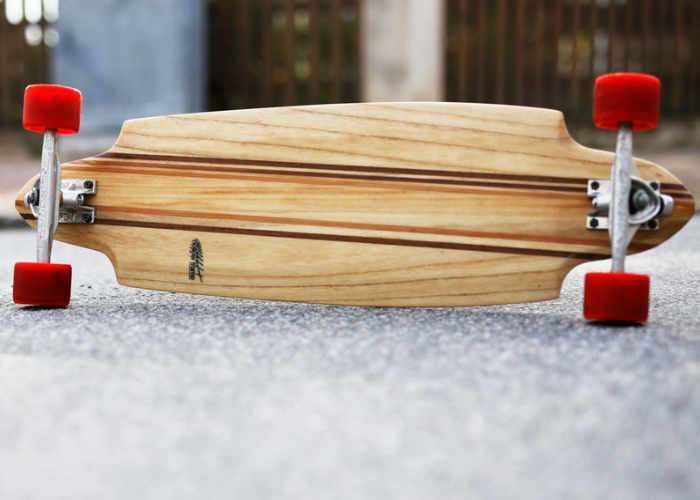 The custom-built long boards will reach speeds of up to 45km/h and offer a range of over 25km on a single charge. For more details jump over to the Kickstarter crowdfunding website via the link below. The goal of the project is to create a prototype of an handmade exclusive electric skateboard. The prototype will be the basis for further productions of exclusive boards. Every board will be tailor made to meet the customer’s every wish in both design and performance. Every produced board will be made in very close relation with the customer. The prototype deck will be made by hand by Peter Jarl at Hollow Frame. Peter will be building the deck from the beautiful wooden material Paulownia. Every deck that will be built will be totally unique with focus on design and craftsmanship. Further down you can watch a video of how Peter creates his boards. The picture below is a Paulownia deck without the electrical components. Many confuses an electric skateboard with a toy like an Airboard. An electric skateboard is far from a toy. It’s the perfect commuting vehicle.The goal is to create boards that doesn’t compromise range, speed and of course design. With the right configuration our board will reach speeds of up to 45km/h and range over 25km. If we reach or goal on Kickstarter the next step will be to build the prototype board and evaluate it. When the evaluation process is complete we will start taking orders and production will begin. When everything is up and running we will also offer to make electric skateboards from our customers own boards. For more information on the new Exclusive Handmade Electric Skateboards jump over to the Kickstarter website for details by following the link below.